The broader Regency period 1795-1820 stands alone as an incredible moment in fashion history unlike anything that went before or after. It was the most naked period since Ancient Greece and before the 1960s, and for the first time England became a fashion influence, especially for menswear, and became the toast of Paris. With the ancient regime deposed, court dress became secondary and the season by season flux of fashion as we know it came into being, aided and abetted by the proliferation of new ladies' magazines. 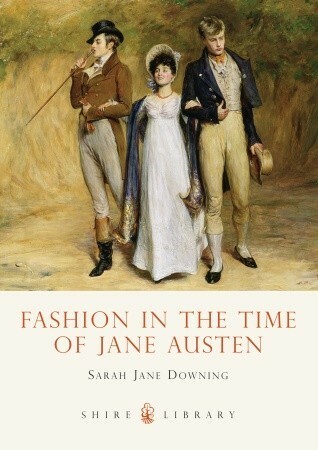 Fashion in the Time of Jane Austen was an interesting read as I liked the way the author linked fashion changes to the events that influenced them. However, I would have liked the book to be a little longer to include more information on the clothing of the day, even if it was only in the form of a glossary that listed every item of clothing with a short sentence on what it was and when it was worn. As an author, I want to make my works historically accurate and I have yet to find a decent book on Georgian/Regency fashion that gives me a definite answer regarding my questions on their mode of dress. I'd hoped this would be the one, but sadly not. Still, it was engaging and will please Jane Austen fans.